Anyone can build a castle with sand, but can you build a castle on sand? 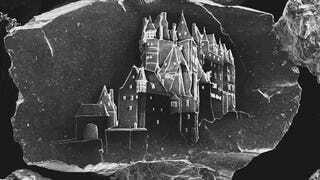 Artist and photographer Vik Muniz collaborated with MIT researcher Marcelo Coelho to engrave a castle onto a single granule of sand. The process brilliantly combines both high and low tech in the history of imagemaking. Muniz sketches the castle using a camera obscura, a pre-photography tool that helps him to render a 3D object into a 2D image. Then, Coelho uses an electron microscope—specifically a focused ion beam microscope, which is used to manufacture semiconductors—to etch the image onto a piece of sand. This Creators Project documentary chronicles their collaboration. This seems like an easy task for the microscope; it's just different kind of silicon, right? It turns out you have to have a perfect grain of sand. Some were too hard, some were too soft. But at least three grains were just right, and were transformed into these sculptural works of art where the textures of the sand almost make the castles look as if they're nestled on a rocky cliff. The castles are then photographed and turned into large-format prints, which thankfully allow them to be seen by the human eye.